Remember when Pharrell wore Smokey’s hat to the 2014 Grammys? 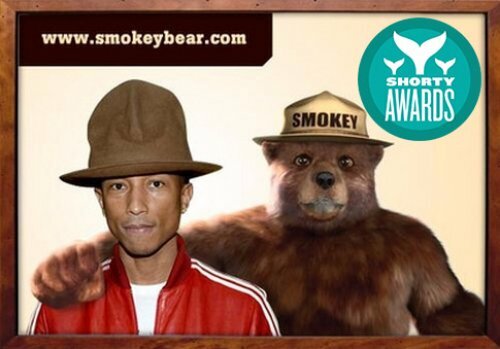 At this year’s Shorty Awards, Smokey Bear took Silver for real-time content marketing‬. Also, AT&T’s It Can Wait anti-texting and driving campaign that we built the site for working with Omelet received honorable mentions in best multi-platform, best social good campaign and best use of a hashtag. 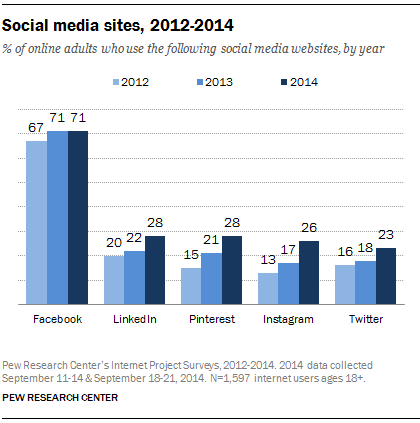 No real surprise – as of September 2014, the Pew Research Center finds that Facebook remains by far the most popular social media site. But in terms of speed, Instagram is the fastest growing with Pinterest close behind. HelpGood experimented with the fast growing Instagram social network for the USDA Forest Service with the Ad Council to see if Smokey Bear could boost the government agency’s visual presence. It worked. The majority of feedback and sentiment was positive and that wasn’t even with relying on Smokey selfies. Instagram is a great platform for your nonprofit to connect with young Millennials for your cause marketing and social good outreach efforts. 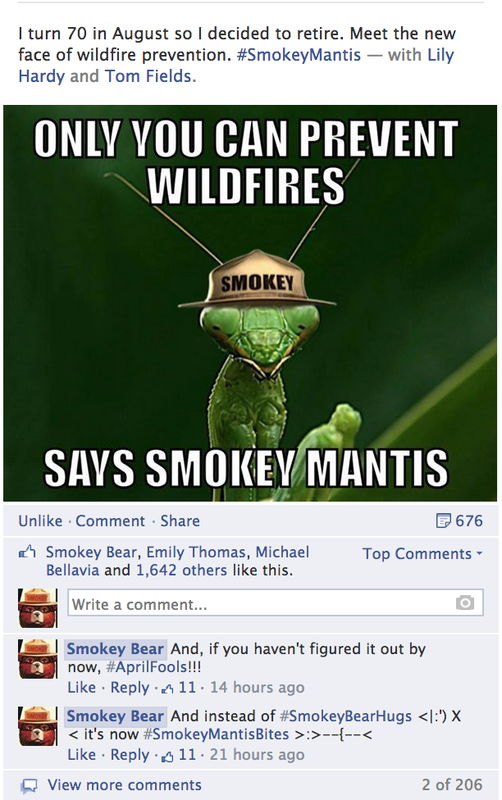 As the community managers for Smokey Bear for over 4 years, we’ve helped grow his social media following to over 300,000 Facebook friends and helped him expand his footprint to multiple social networks. In that time we’ve also seen that his fans are always looking for new ways to spread his wildfire prevention message. HelpGood is proud to announce the release of Smokey’s first-ever digital book, “Smokey Bear and the Campfire Kids.” We developed the app as our first foray into social good products that entertain while doing good. A portion of all proceeds goes back into the Smokey Bear education campaign. As content marketers, we know that storytelling is a valuable tool in creating awareness. We designed this book to help move Smokey’s wildfire prevention message forward and to deepen his relationship with his biggest fans. Smokey Bear and the Campfire Kids is being released on the heels of Smokey’s 70th Birthday, his induction into the Advertising Week Walk of Fame and in support of Fire Prevention Week (Oct. 5-11). It is the first in a planned four-book series of Smokey Bear Apps featuring Smokey and his enduring “Only You Can Prevent Wildfires” prevention message. The book features illustrations and animation by the Emmy-winning Animax and continues in the tradition of Little Golden Books’ Smokey stories his fans fondly remember. Yesterday was pure fun for marketers in every industry. There were loads of tech companies and for-profit brands releasing elaborate videos and fake products. 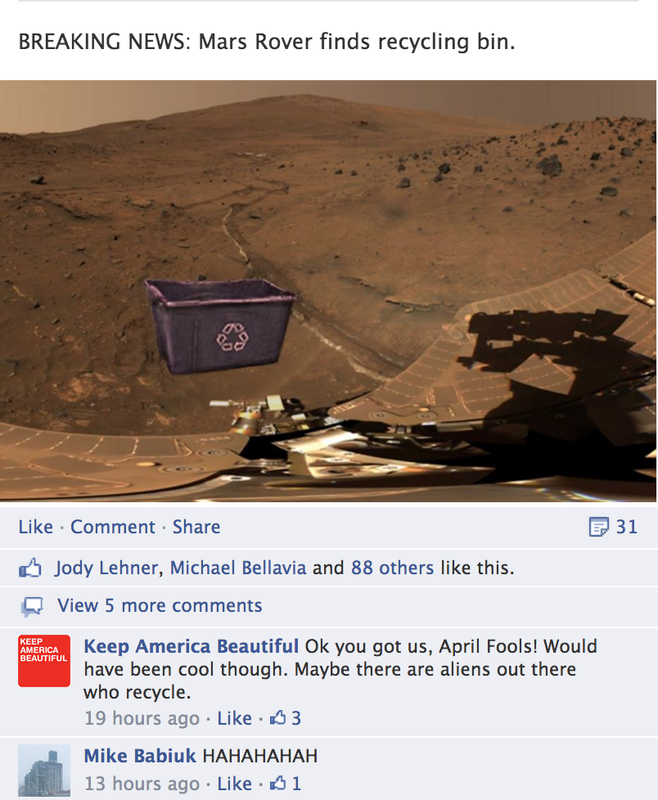 Here’s an April Fools round-up from the world of social good. 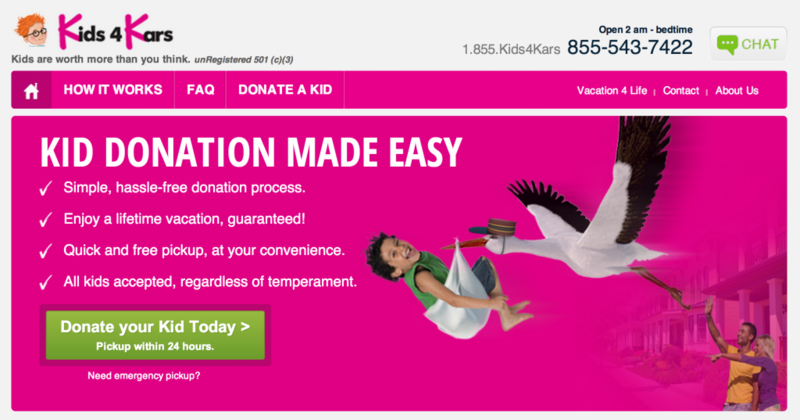 Kars4Kids called for parents to donate their children to get attention for a real campaign they launched encouraging parents to spend quality time with their children. They cited research from the Boston Medical Center that 73 percent of parents are distracted by their devices during mealtime with their children, a time traditionally reserved for family bonding. Footwork is a cardboard car that people operate Flinstones style.TOMS partnered with Uber to deliver the car to you. All this to combat the carbon footprint. YouTube pranksters, Break, encouraged its 1+ million subscribers to put a positive spin on April Fools by pranking people with something great. Every use of #PrankItFWD generates a $1 donation to DoSomething.org. Check out this video of a waitress getting buku tips which include a vacation, dream job and new car. Did you see other great April Fools pranks from cause marketers? Please share with us below! When real-time marketers post up in front of the TV on an award season Sunday night, they may have a list of pre-written tweets and scenarios bouncing around in their minds to tie-in to their brands and campaigns. However, once you start planning you start to chip away at the magic — the Blackout Oreo Magic that we all hope for and can never see coming. All you can really do is fire-up the Photoshop and track the conversation so you’re ready just in case the biggest music producer in the world wears a hat that looks like the hat of the bear you tweet for. 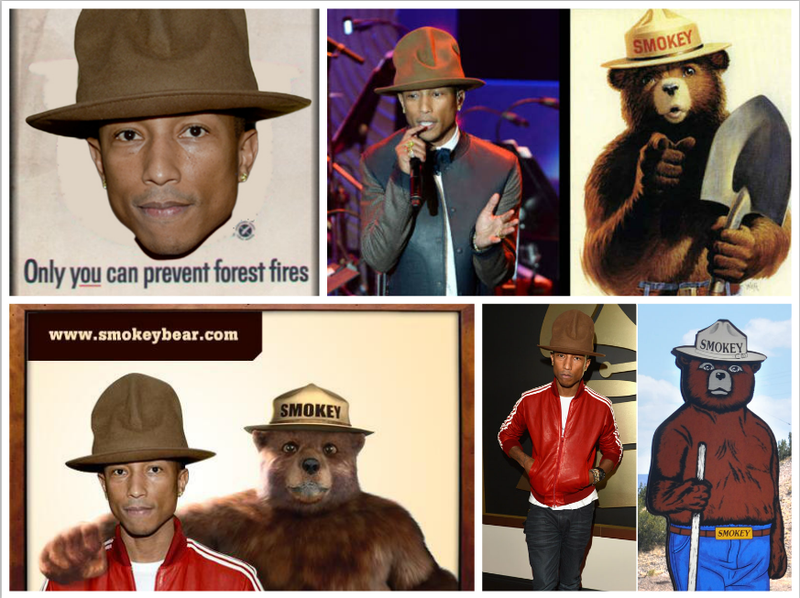 The 2014 Grammys and Pharrell Williams gave Smokey Bear a gift and HelpGood was ready to accept it, amplify it and make sure the whole world received that gift too — along with important wildfire prevention messages, of course. We generated images immediately featuring Smokey and Pharrell and jumped into the conversation. Within 24 hours, Smokey’s Twitter followers grew by almost 25 percent. Organic search traffic to our campaign website, SmokeyBear.com, increased by 123 percent. In total, there were more than 36,000 tweets about Smokey, resulting in more than 58.5 million impressions. Almost immediately, the press began including Smokey in the night’s round-ups. By the next morning, more than 180 media outlets were talking about Smokey, including The Today Show, CNN, Buzzfeed, Los Angeles Times, New York Post, Wall Street Journal, New York magazine, New York Daily News, Elle, Daily Beast, Huffington Post, Adweek, NPR, People, Extra TV and USA Today. 2) The fact that our client completely trusted us and gave us the authority to publish without approval was essential. (A trust built over 3 years). 3) We had no extra budget for this, it’s apart of our standard community management fees. The ROI was unreal. If you want even more great information on the story of Smokey Bear and the Grammys, read Meg Rushton’s post that includes tips on real-time marketing on Ad Council’s blog for social marketers. June 2012 marks the two year anniversary with Smokey Bear and HelpGood. We’ve come a long way in helping push Smokey’s wildfire prevention message. HelpGood has deployed multiple social media marketing tactics and created new content to support the campaign. We have created original apps for the web and mobile devices, as well as imagery, articles, and more. Overall we have had a really wonderful time with this campaign and hope to push Smokey’s message to the furthest reaches of the universe!